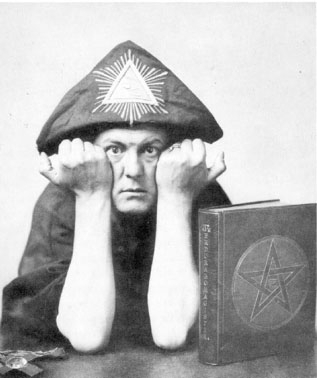 Aleister Crowley was a complicated figure. People either love him or hate him. He really riled people up in the occult community. Everyone has their opinions on him. His peers couldn’t stand him. Still he was able to garner a huge following, one that is still around today. I got to thinking about this topic after my husband and I had a discussion about “the will” and how often that word gets around in the occult community. I think Crowley made some great contributions to the western mystery tradition. I also think that he made some determinants. Anyone who has read and used as a reference 777 and Other Qabalistic Concepts can see that Crowley was well versed and trained in the western mystery tradition. I believe that he let his love of drugs and excess get in his way of continuing to advance spiritually. Crowley loved to party. He went hard at everything he did. His efforts in spiritual advancement were sincere. I do believe he had a real desire to spiritually advance and become a great magician. He was just clouded by personal demons and desires. I feel there exists almost a contradiction in Crowley as a person. He had a strong background in eastern philosophy and yoga. He was practicing Qabalah magick. To me names such as “the Great Beast” and “the Wickest Man in the World” are contradictory. These invoke images of an evil man. There are satanic undertones. These nicknames are a direct contradiction of Crowleys practices and beliefs. Crowley was very intelligent. The media made all sorts of outlandish claims and gave him these nicknames. Instead of refuting them Crowely used them to his advantage to drum up patrons and book sales. His influence is still felt today. Just look at all of the new occult personalities that have propped up and their teachings of true will. The Ordo Templi Orientis are still active today. Chapters can be found all over the United States. In the end I am in the middle of the spectrum. I think his story and work is much more complicated than some scholars propose. One thing everyone can agree on is that he did contribute a great amount of fantastic material to the western mystery tradition. I think every serious student of magick should read Book 4 and have 777 and Other Qabalistic Concepts on hand as reference material. Also The Thoth deck is fantastic. Its filled with so much symbolism. I am still exploring it myself. I would just encourage students out there to read other occultists work. My suggestions would include Dion Fortune, Richard Steiner and from more modern times Daniel Craig. Don’t limit yourself and get caught up in reading one viewpoint. What is your opinion on Crowley? Do you love him or hate him?